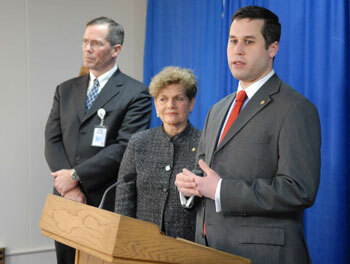 Assemblyman Kenneth Zebrowski (D-New City) along with the Department of Health, Senator Tom Morahan (R-New City) and Assemblywoman Ellen Jaffee (D-Suffern) announced at a press conference today the formation of a Hepatitis C advisory council, $1.6 million in funding for research and treatment and the establishment of May as Hepatitis C awareness month. Zebrowski and State Health Commissioner Richard F. Daines stressed the lack of public knowledge of the disease and the importance of New York taking necessary steps to address what is quickly becoming an epidemic. "This disease and those afflicted with it have been in the dark for too long. I am hopeful this advisory council and the $1.6 million in funding will lead to public awareness and scientific advancement, and that it will help stall what is becoming an epidemic," explained Zebrowski. This subject is personal for Zebrowski whose father (former Assemblyman Kenneth Peter Zebrowski) passed away in March of 2007 at the age of 61 from the Hepatitis C virus. Zebrowski contracted the disease in 1973 from blood transfusions during an 18 hour operation to remove a brain tumor; however, he was not diagnosed with Hepatitis C until 1996. The younger Zebrowski gave a personal account of his father's illness which included misdiagnosis, misinformation, and an overall lack of clarity regarding the risks of the disease and treatment options. Zebrowski was joined at the press conference by several members of his family including his mother Linda, his sister Kristen, his grandfather Al Magnatta, and several aunts, uncles and cousins. "The confusion and misdirection experienced by my father and my family is unfortunately typical of thousands of New Yorkers and millions of Americans who are afflicted with Hepatitis C. My family and I are certain that my father would encourage us to use his name and story in any way possible to help other citizens deal with this disease. Despite the difficulties of grieving in public, this cause has afforded my family and me the ability to achieve some good out of my father's death," said Zebrowski. The commission is made up of 15 members who are experts in the medical field along with a member of a Hepatitis C advocacy group. The council will be chaired by Commissioner Daines. "Hepatitis C has been a hidden epidemic. We need to bring Hepatitis C out into the light of day and bring public health approaches to address this public health issue. The Council is a major step in this effort," said Commissioner Daines. Hepatitis C, a liver disease, is the most common chronic blood borne viral infection in the United States. It is estimated that anywhere up to 4 million people are infected with Hepatitis C or 2% of the general population. In New York it is estimated that 304,000 citizens have been infected with hepatitis C, including nearly 240,000 with chronic infections. People who are infected may not exhibit symptoms for 20 or more years. Zebrowski was joined at the press conference by Senator Morahan and Assemblywoman Jaffe, both friends of Zebrowski who last year jointly sponsored legislation to form a task force. "I am pleased that Governor Spitzer has taken executive action to implement the recommendations of legislation introduced in the State Legislature by Assemblywoman Jaffee and myself, which sought to create a knowledgeable advisory council dedicated to assess the state's response to the high rate of Hepatitis C, the deadly disease that lead to the passing of my friend and colleague Ken Zebrowski, Sr.," said Morahan. "The loss of our dear friend and colleague Ken Zebrowski last March opened all of our eyes to the enemy Hepatitis C really is. For far too long this terrible disease has gone unnoticed, but the impact it has on our communities, and the number of families so tragically affected by it is enormous," added Jaffee. In addition to the advisory council and $1.6 million in funding, Zebrowski passed a resolution memorializing Governor Spitzer to proclaim May Hepatitis C Awareness Month. He was joined in the Assembly chambers by numerous advocates of promoting awareness of the disease and persons currently afflicted with Hepatitis C. As these concerned New Yorkers looked on, Zebrowski explained to his colleagues the devastation of the disease that had unfortunately been given a face during last year's legislative session. The resolution passed unanimously.